Xiaomi Mi Power bank is one of the best and affordable power bank available in India. For a long period the powerbanks were out of stock (I was using a 10,000 mAh Mi Powerbank). 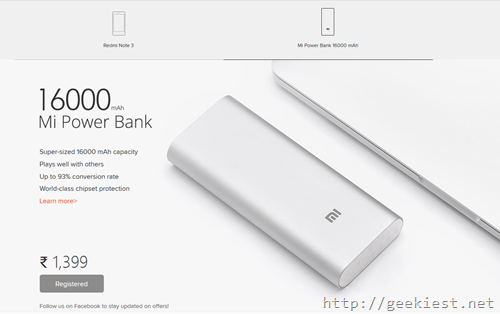 If you are looking for a Mi Powerbank here is a happy news for you, Xiaomi will be bringing the 16,000mAh powerbank for sale via their official website on 16th March 2016 along with the latest Redmi Note 3. The company claims it will give you up to 93% of conversion rate, which is a very good one. The company also claims that you will be getting a minimum output of 10,000mAh that is above 60%. The price for the 16,000mAh power bank will be INR 1,399. and all the orders above INR 500 will not have any shipping charges. You can visit http://www.mi.com/in and register for the sale. At the time of registration you need to select the product you like to purchase. The company clearly says that it is ok to change the product you selected at the time of purchase. Sale starts on 2016 March 16, 2PM Indian Standard time. 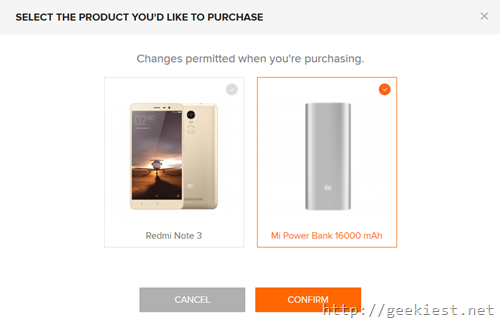 Register for the flash sale of Mi 16,000 mAh powerbank and Redmi Note 3 now.